Greens just plain rock! 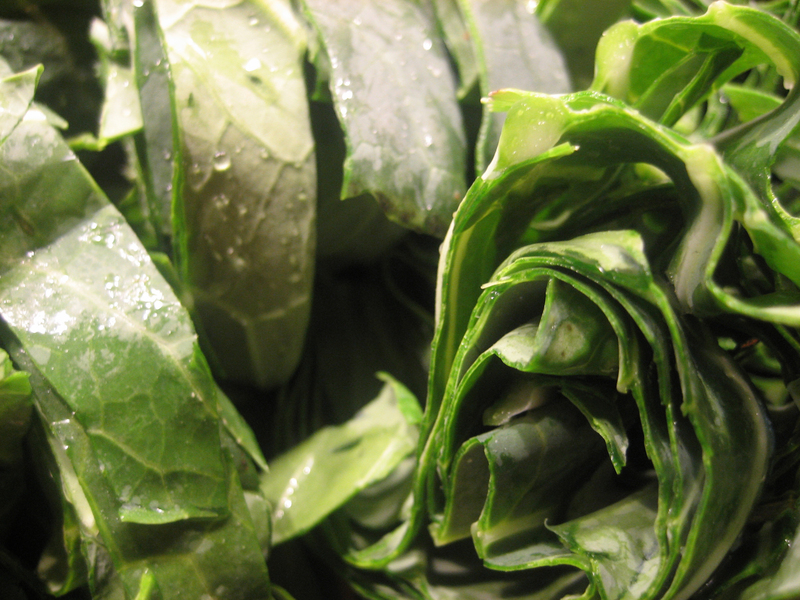 Packed full of vitamins and minerals including one of the best non-dairy sources of calcium on the planet, collards are a great way to ensure that you’re on your way toward eating healthfully. I’ll start off with a very basic recipe for a quick dose of goodness and then over the weeks include some more recipes on how to handle and add variety to these great greens. Dead simple. Drizzle a little bit of olive oil into a pan, preferrably one with sides to it. Add a clove or two of sliced garlic; mince it if you want a more potent dose of garlic flavor. Toss in a pinch or two of red pepper flakes [ or none at all if you don’t like the heat] and stir about until the garlic releases it’s aroma. Toss in the sliced collards and coat with the olive oil. Cook for a few minutes and then pour in a bit of vegetable broth and cover. The longer you cook them the softer they shall become. H and I really like them cooked for a minimal amount of time; perhaps 5-10 minutes. If you’re going to cook them longer make sure that you check the broth level so that they do not scorch.